I am not keeping up with my blog very well. 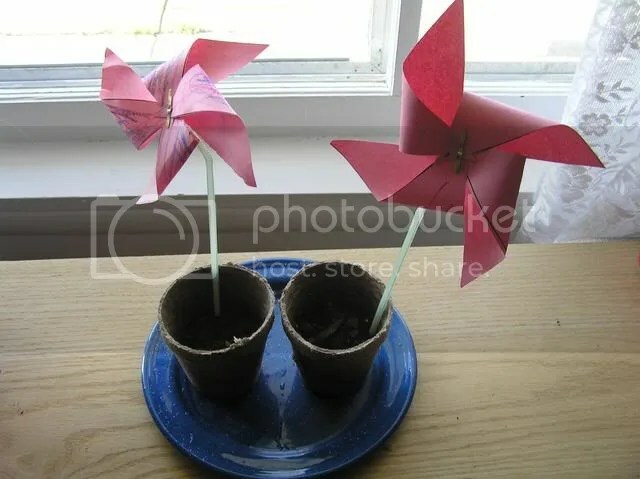 Wednesday, we went to the local homeschool co-op meeting to learn a bit about recycling and composting and got to make pinwheels and then plant seeds for some sunflowers. Afterward, we headed over to the toystore with some of our friends and then had them over to our house to play for a bit. Friday was a friend’s birthday party at Fun N Stuff where we got to play laser tag and hang out with some of the folks we haven’t seen in a while. Unfortunately we had to leave a bit early because my son’s stomach hurt. Fortunately, we got home before the puking started. After a few hours of that, I headed out for a much needed break at Alladin’s with a girlfriend. While I was gone, he slept and recovered quickly and strangely asked for calamari again when he woke up (like the last time he was sick). There must be something to the breading, saltiness, fat levels that make him feel better (???). We were out. He settled for shrimp. “Sew What! Skirts: 16 Simple Styles You Can Make with Fabulous Fabrics” -This one shows you how to make your own skirt patterns instead of buying patterns and then having to alter them. The instructions are well written and illustrated and I am looking forward to trying them out! “Sew U: The Built by Wendy Guide to Making Your Own Wardrobe“– This one has 3 basic patterns included and then takes you through all the steps neccesary to customize them for the looks that you want. I also got a new cookbook, “The Sneaky Chef: Simple Strategies for Hiding Healthy Foods in Kids Favorite Meals“, to try out on the kids. After grocery shopping today, I took the time to make up most of the purees that get used in the recipes throughout the book. We tried out the pasta sauce with the “hidden” additions of white bean paste and carrot/sweet potato puree and could tell no difference. In fact, dinner was downright yummy! I am going to make a concerted effort to try out each of the recipes and see how they fly with my kids. Even her brownies hide secrets like whole grains, bluberries, and spinach. More info and some sample recipies can be found here. Ok- I am done unloading for tonight. I will try to keep my camera more out in the open. I think I keep up on the blogging a bit better when I have pictures to remind me of what has been happening.